Dating back to ancient Egypt in its earliest form, bowling is more physical than you may realize. 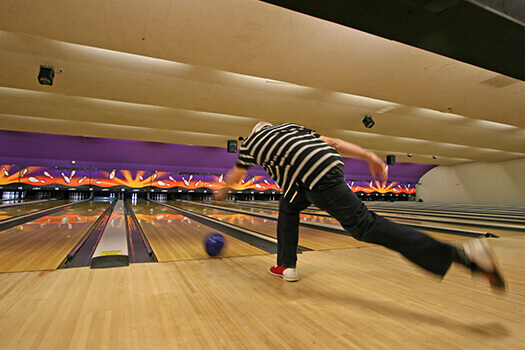 During a typical game, most bowlers have to lift, bend, and stretch. And while bowling is certainly a fun activity, the movements involved may contribute to sore back-supporting muscles, especially if you already have a history of spine-related issues. Before you toss your next bowling ball down the lane, consider some of the common causes of bowling-related back pain. Just because most pros use 14 to 16-pound bowling balls doesn’t mean this weight is right for you. Pay attention to the weight when choosing your preferred bowling ball, especially if you’re going to invest in one you’ll be using consistently. Balls come in weights that typically range from 6 to 16 pounds. The general rule is 1 pound per every 10 pounds of body weight plus one. For instance, a 120-pound person would select a 12 to 13-pound bowling ball. The shoes you rent at your local bowling alley may not have enough traction left to prevent you from slipping or falling as you thrust the ball forward down the lane. If you bowl regularly, invest in a good pair of shoes. Otherwise, do a visual inspection of your rental shoes to ensure there’s sufficient traction on the bottom to prevent injuries that could affect your back. Even if you’re not one of the 2 million or so Americans in a bowling league, it’s still important to pay attention to back pain that either comes on suddenly or slowly develops when you’re done with your game. If your discomfort doesn’t go away with some heat and ice applications, over-the-counter medications, or a couple days of rest, see your doctor or a Santa Monica spine surgeon before attempting to make your next strike. In some cases, bowling-related back pain may be severe enough to require minimally invasive back surgery. Santa Monica residents can trust the expert surgeons at The Spine Institute to diagnose the source of their pain and help them find an effective means of relief. Call 310-828-7757 today to schedule an appointment.